Halloween fans flock to Thornhill Woods Haunted House every year during Halloween week for the thrill of the fright and to donate to Toronto’s Sick Kids Hospital. Owner Chris Ainsworth, who talked to Val Tobin about home haunts in general and his haunt in particular, has been setting up his ever-expanding array of tombstones, zombies, and other props since 2004, and taking donations since 2005. In that time, he has seen the popularity of his home haunt grow in direct proportion to the growth of his prop collection. Home haunts are becoming increasingly popular and, if Ainsworth’s collection is any indication, increasingly sophisticated. According to the Haunted House Association website’s Haunted Fast Facts page, Halloween is the second largest commercial holiday in the United States. Ainsworth, though Canadian, exemplifies this, saying that Halloween is his favourite holiday after Christmas. Each year he tries to outdo the previous one when he begins planning his next haunt, something he starts as early as December. Since his 2010 haunt was spectacularly scary, he will be hard-pressed to top it. Ainsworth is pulling out all the stops and has even done some informal research. He says he conducted a poll from amongst his Facebook friends to find out what scares them and explains, “the main things that people are afraid of are spiders, snakes, bugs, clowns, and the dark.” Anyone considering visiting Thornhill Woods in future, beware: there will be spiders and snakes. Of course, there will also be the requisite zombies and tombstones, a staple for any home haunt, which Ainsworth mostly creates and builds himself. He says that all of his zombies are custom made, and can’t be found anywhere else. This is a typical practice for many haunters, who have as big a passion for creating and building things as they do for triggering the flight response. Another passion they share is contributing to a good cause. Thornhill Woods is not unique in its devotion to a good cause. The Haunted House Association says that there are more than 3,000 haunts in the States that do what they do for charity, many of them running only one or two weekends in October, or even just on Halloween night. Ainsworth says that his decision to contribute to Sick Kids Hospital in Toronto came from his nostalgia for the old Halloween United Nations International Children’s Emergency Fund (UNICEF) campaigns that he participated in as a kid; a spirit of giving back, since his own children have benefited from care at Sick Kids; and a desire to do something for kids on a night that is all about kids. As the number of props and trick-or-treaters has grown since 2005, so has the donation money that Thornhill Woods has scared up. 2010 was their best year so far, with $4,781 raised. Ainsworth says that 100% of the money donated goes right to Sick Kids, including his own $500 yearly donation. Part of the donation goes to a special fund that helps kids in the hospital on Halloween night celebrate it with costumes and candy. The rest goes to where the hospital needs it. 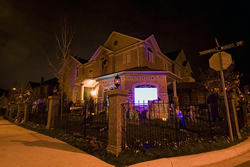 If you are driving into the neighbourhood, park legally and in consideration of the people who live in and near the home where the haunt is held. Ainsworth says that, in previous years, people have blocked driveways, making it difficult for his neighbours to pull into or out of their own driveways. Now, he gets a permit from the town and blocks off the street. Find out if the haunt collects charitable donations, which can be either cash donations or non-perishable food items for the local food bank. Make a contribution. Look, but don’t touch. Ainsworth displays a sign at his haunt that reads “Enter at your own risk. Touch nothing and nothing will touch you.” It’s a humorous way of letting people know that props are for viewing pleasure only. Props, even homemade ones, can be expensive as well as fragile. Verify that kids are welcome at the home haunt. Some haunts are not child-friendly and it is best to find that out before you arrive and disappoint your child. Consider your own tolerance to scary situations. As Ainsworth says, “The whole point is, you’re there to be scared.” Are you okay with going to a place where the goal is to scare you for your enjoyment? If you’re easily scared, investigate how far on the fright-meter this haunt might read. Some home haunts can be very intense. If you can’t handle it, you won’t enjoy it. If you do decide that this type of entertainment is for you, then there are websites set up to help you locate a home haunt in your area. There are a number of websites that have a directory listing of haunts all over the United States and Canada. One of the better known and more popular sites is the Haunted House Association website. From here, you can find not only haunted houses (professional haunts as well as home haunts), but you can also find pumpkin patches, hayrides, and corn mazes. Haunted House is another U.S. locator site that helps you find haunts, as well as houses that are purported to be haunted. The Ontario Haunters Club is a website that lists haunts in Ontario, with plans to expand the directory to include Canada-wide locations. According to Ainsworth, the website is currently in transition, but it is the only Canadian haunters site available at this time. There is something deliciously scary about a haunted house attraction. A home haunt, while not at the level of an amusement park or professional haunt, can come very close and is far beyond simply dressing the house up for Halloween. When I walked through Ainsworth’s haunt, I was suitably impressed and suitably scared. Between screams, I laughed a lot. It was thoroughly enjoyable. Home haunters are passionate about what they do and are only happy when they have made you joyfully frightened. Find a home haunt near you and experience the thrills for yourself if you dare. Ainsworth, Chris, Thornhill Woods Haunted House (Accessed March 2, 2011).